The Exclusive Apartment is situated directly on the sea front, in an exclusive bungalow complex which offers total privacy with an excellent infrastructure. The combination of Spanish and Moroccan architecture will enchant you immediately. The spacious living area offers plenty of room for your family as well as your guests. The wonderful view from the living room overlooking the sea will put you in a mood immediately. In the fully equipped American style kitchen (which includes an CERAN-oven, hob, refrigerator, etc..) meals can be prepared at ease. Not only the living room but also the two ample en-suite bedrooms are exclusively furnished. Enjoy dining with a stunning sea view from the round table in a Spanish style oriel. The secluded and spacious terrace or balcony surrounded by tropical plants invites for unimpaired sun-bathing. The complex which was completely refurbished in spring 2016 is situated directly on the sea front, in an exclusive bungalow complex which offers total privacy with an excellent infrastructure. The combination of Spanish and Moroccan architecture will enchant you immediately. Pool: Enjoy swimming in the pool which is heatable all year round and overlooks the sea. Refreshment or small snacks are served at the pool bar (the pool bar is not everyday open). Sun beds are at your disposal around the pool area for sun bathing after swimming. Sports: Windsurfing and Kite surfing: Club Mistral has it’s main base directly on the beach in Bahia Feliz. There are approx. 70 boards with 100 rigs as well as state of the art kites at your disposal. Mountain biking: Gran Canaria is an island with innumerable routes, which are suitable not only for bicycle fans but also for visitors, seeking direct contact with nature. Let it be a down-hill or a long distance ride – the bike is a perfect vehicle to experience indescribably beautiful landscapes. State of the art and high quality bikes may be rented directly in the proximity. Organized tours are also available. Trekking: The entire island is covered by an ample network of trekking routes. There are easily accessible pathways, “caminos reales”, donkey paths and in addition, small ways and paths, which are reserved for the experienced trekker. Tennis: There are two tennis courts close by. Wellness & Activities: Europe’s largest centre of Thalassic therapy lies close by and offers a choice of wellness spas, relaxation and swimming in hot sea water. Also a detailed medical examination for the preparation of a personal program, massage, water gymnastics, bubble bath, underwater shower, pressure shower, sauna followed by body-peeling, cleaning of the skin with massage, manicure, pedicure, algae-therapy, bubble-bath with algae, facial treatment or treatment to improve skin texture as well as treatment for rheumatic complaints are offered. The wonderful view from the living room overlooking the sea will put you in a mood immediately. In the fully equipped American style kitchen (which includes an CERAN-oven, hob, Microwave, refrigerator, etc.) meals can be prepared at ease. Enjoy dining with a stunning sea view from the round table in a Spanish style oriel. Enjoy swimming in the heatable pool overlooking the sea! Please reserve the cot in advance. We had a lovely week away from the cold British weather to celebrate my brother’s 60 th BIrthday. We booked as 2couples and it is our first visit to the island. We had arranged for a free transfer from the airport but no one turned up to meet us so we had to get a taxi which cost €35. A lady called Sasha gave us our keys and told us there was no car available to pick us up and we should have been notified. The complex is lovely and very clean, the pool area again very nice but the pool bar not open. The apartment was a mix of modern and of being dated and tired looking. The second bedroom was small and lacking in storage. Half of the wardrobe was locked and the other half had a huge bag of toys and in addition there was only the bedside drawers. The second bathroom door was difficult to be kept shut and again the vanity unit was locked which made limited space available, the shower was tiny with a curtain around which made having a shower almost comical as there was no shelving for toiletries. All bed linen and towels needed replacing. The kitchen was well equipped and great to use although the small fridge in the lounge needed updating. The view from the balcony was lovely and it is in a beautiful setting. As it was our first visit to the island it would have been nice to have had more updated information on what there was locally and how to get about eg; bus and taxi service. The bus service is brilliant and if we had known in advance we could have saved ourselves a lot of money including airport transfer, we left some updated information for the next occupants. The apartment is advertised as luxury, it is definitely not luxury, we were a little disappointed with this and would not have paid a thousand pounds for a week in January. We became friendly with other visitors on the complex and found that they paid £1000 for a 3 week stay 😩�. We have visited many places including the other islands and I’ve never left negative comments before but I do feel we have not had the level of accommodation we expected. We had a fantastic family holiday in this lovely two bedroom apartment. My 4 year old had fun in the heated pool and there was a great panoramic view of the ocean from the pool area. The apartment was spotless and located in a small lovely village. The only noises we heard were seagulls and the waves. The owners offered us help, whenever we needed something during our stay - a very secure feeling when you are abroad. This apartment was great value for money and just what we were looking for. I would recommend this apartment to everyone who plans a visit to Gran Canaria - much better than any hotel available. 6 Stars! This apartment (unit 29) is nicely situated pool side and a few hundred meters from several swimmable beaches in Bahia Feliz. 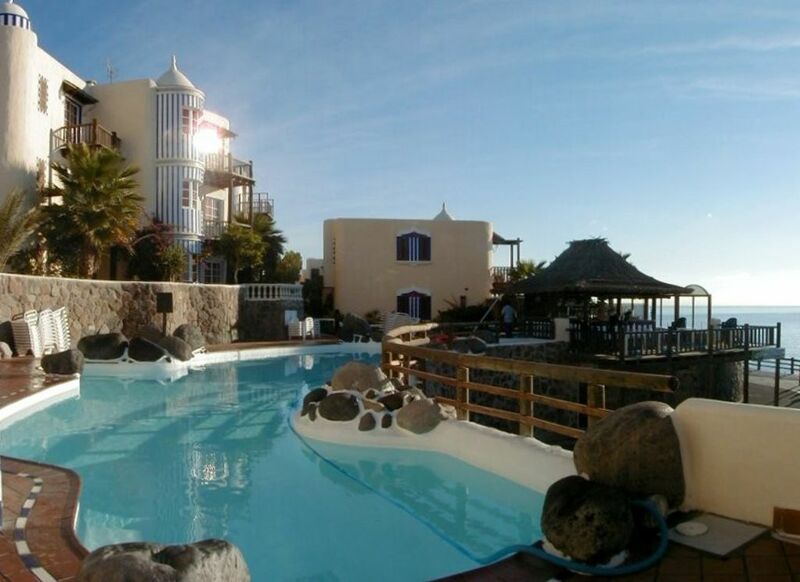 Bahia Feliz is conveniently located on Gran Canaria with easy access to the North and the West sides of the island. Numerous restaurants are within walking distance. Though as another traveler from England expressed, the food on Gran Canaria isn't exactly Cordon Bleu. I may be a bit jaded as well since both my wife and I are suffering from Travelers Diarrhea following our visit to Gran Canaria. My main complaint and really the only complaint I ever have when renting through HomeAway / VRBO is when the property doesn't match the expectations set on the website. In this case, there were three significant misses. The first was the fact that the unit wasn't air-conditioned. After a closer inspection of the information on HomeAway, this owner has multiple apartments on this property and some are air-conditioned and others are not but to decipher this without a deep inspection of the content on the site was not possible (at least when we made our booking - this may have since been changed). Additionally, the only ceiling fan in the apartment was not operational. The staff on site were kind enough to offer us floor fans to make it a bit more comfortable at night, but moving hot humid air around is of limited effectiveness (especially when there is already a constant 10-20 knot wind blowing across the Canaries). We were also looking forward to the pool side bar (The Coconut Bar) and enjoying some tropical drinks while relaxing pool side. Unfortunately, the bar was not open once during our stay (apparently this was their vacation week - our bad luck I guess). Finally, and most significant to our kids ages 15, 11 and 9, was the fact that there is really not wifi available in the apartment. There is some wifi signal accessible from the small veranda outside the unit and also pool side, so to say there is NO wifi available would be an overstatement, but given the temperatures during most of the daylight hours, wifi access was significantly limited and one should not get the impression that wifi is available in the apartment. There is NO WIFI SIGNAL available inside the apartment. Despite these disappointments, this apartment has a lot to offer, which is why I am still giving it three stars. The pool side location is ideal and if you don't care about air-conditioning or wifi then it may be perfect for you. an excellent location ...a wonderful place where you can spend a memorable vacation ! Mrs. manager is very friendly and jovial . We are just back from our fabulous stay at the apartment in Bahia Feliz. This place is a home from home. I was very nervous booking as this is the first time I have booked an apartment using any web site but I can honestly say weI were all more than impressed with the apartment and with Gran Canaria.The apartment had every conceiveable thing you could need from books, toys for children and TV, washing machine and a lovely view of the sea. The apartment and location was even better than described and advertised. The apartment is modern, clean and well maintained. The sand is fabulous on the beach on low tide, you do not need to hire a car (driving very easy and good road signage) we did hire one for three days. We hope to go back next year as this is a lovely island suitable for young family's. Thanks again! Lovely apartment, pictures do not do it justice. I must say we were a bit wary of renting because we had a terrible experience when we rented in Fuerteventura last September, but thought we would give one last try, How glad we are that we did. This owner and apartment restored our faith. The apartment was really comfortable, exceptionally clean, and very well equipped. Everything was there to make the stay easy - no problems with cooking equipment and all other facilities. The apartment is great for two couples sharing, as there is complete privacy for the bedrooms as well as for the bathrooms, and would also be good for families as the second bedroom is not directly off the lounge, there is a hallway between. From the moment we made the first enquiry, any queries we had were answered immediately, and the instructions sent to us with directions from the airport were excellent. One last thing, the pool bar as well as serving drinks and snacks in the day, were doing an excellent meal on a Wednesday evening, and if wanted you could take the meal to your apartment on their plates, and then return them! excellent! We ate in the Rincon Restaurant a couple of times, never had such wonderful tapas and fresh fish and it is so reasonably priced. All in all, a fantastic holiday - enjoyed it so much we are hoping to buy an apartment on the Complex because it has everything you could want for a great holiday, and the heated pool just topped it off! Bahia Feliz is a small settlement with a very good infrastructure. There is a shopping centre, boutiques, restaurants, cafés and pubs, so that guests not necessarily depend on renting a car. You can enjoy a walk along the beautiful seaside promenade which will take you into San Agustin or Playa del Ingles within 20-30 minutes. In the settlement you will nevertheless find some inexpensive car hire. Golf: Of all the golf courses in the world many cannot compete with Gran Canaria, because the island has a special advantage: the climate as well as the possibility of being able to play golf during the whole year. Today Gran Canaria has six golf courses, they are spread out across the island with a distance of no more than 50 kilometres between each one. Shortly this list will be extended to a four further golf courses, which are currently being built. A further advantage of Gran Canaria golf courses is their competitive price, which is below the average. The Green fee of the 18 hole courses costs here about 50 Euros in the off season (between May and September) and 70 Euros in the remaining months. Die Preise gelten bei einer Belegung mit 1-2 Personen. Bei Belegung mit bis zu 5 Personen werden pro Nacht 10 Euro pro Person zusätzlich berechnet. Für alle Nebenkosten wird einmalig eine Tagesmiete berechnet. Wireless Internet und Parkplatz sind gratis. Sonderpreise für Langzeitmieter auf Anfrage. Vermietung und Mietvertrag erfolgt nach dem Ley de Arrendamientos Urbanos 29/1994 (dem Spanischen Mietrecht 29/1994). Guest cancellation policy Policy details If the guest cancel the booking, they have to pay: 50% of the total cost if they cancel at least eight weeks before check-in. 25% of the total cost if they cancel at least four weeks before check-in. If the guest cancels within four weeks before check-in the complete amount (*) of the rental has to be paid. Note: (*) Excluded are the additional cost, which are not to be paid. Guests automatically agree to these terms when they make their first payment.